The brand new LTN RIBs have made their stylish touchdown in Australia. Expertly crafted in Italy, these luxury tenders have all the features you could possibly want in a RIB. The striking tender was penned by designer Alessandro Chessa and manufactured by LTN in the lake district of Italy. All models are built with a minium thickness 4mm marine-grade aluminium plate and hypalon pontoon covers. 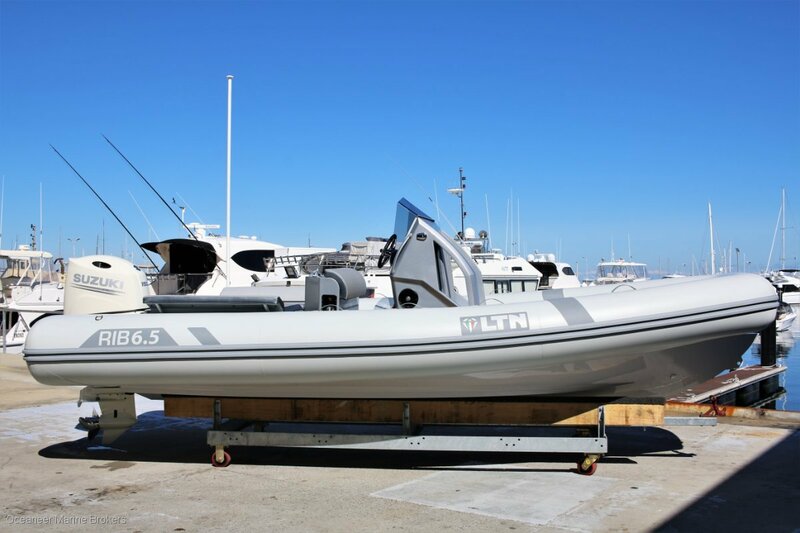 This 6.5m RIB is characterized not only by performance and elegance, but also constructed with functionality in mind. It is worth mentioning the incredible attention to detail used when applying the finishing touches. The 6.5 is available with a range of options and customisable upgrades. Yamaha and Suzuki outboard options both complement this vessel with performance and reliability, with a maximum power rating of 200HP. Expect speeds of about 40 knots with even the entry level 150HP outboard. Garmin and Raymarine can provide great electronics packages to suit the most discernible skipper, with the ability to customise the console how you prefer. Enjoy listening to your favourite music with the Fusion audio package, including a bluetooth head unit for wireless connectivity and ease of control. Sit back and relax with the vast amount of seating and comfortable lounge cushions as standard on all models. A great option is the addition of a high strength umbella which conveniently slots into its holder on the helm chair. Enquire today for a demonstration and to receive more information on these beautiful new RIBs. Other models available include the 8.3m, 9.3m and 10m. Call Oceaneer Marine Brokers on +61 8 9243 6373.
electronicsGarmin GPSMAP 7408 GPS Plotter/Sounder. Raymarine options available.